So what to do with all of the kale from my garden? I had to look around and find a bunch of different recipes that I thought the family would enjoy. I don’t mind cooking it with onions and bacon and eating it just like that, but the rest of the family isn’t so fond of it that way. I found a few recipes in my files that I’ve had forever. I couldn’t even tell you where I originally found them. 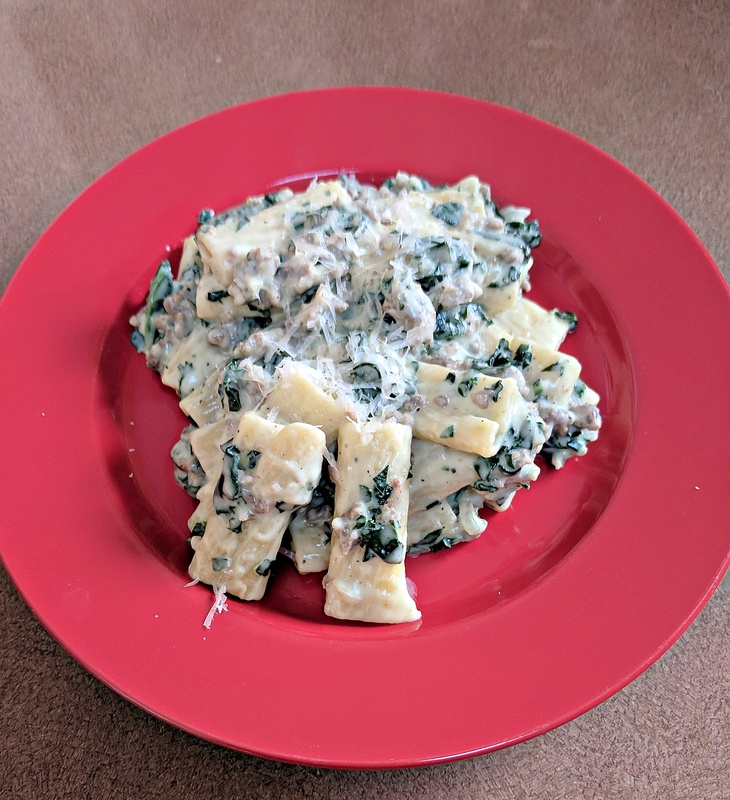 This particular recipe originally called for Swiss Chard but I figured substituting kale would work just fine. It did. I think it probably was even better than using the chard. 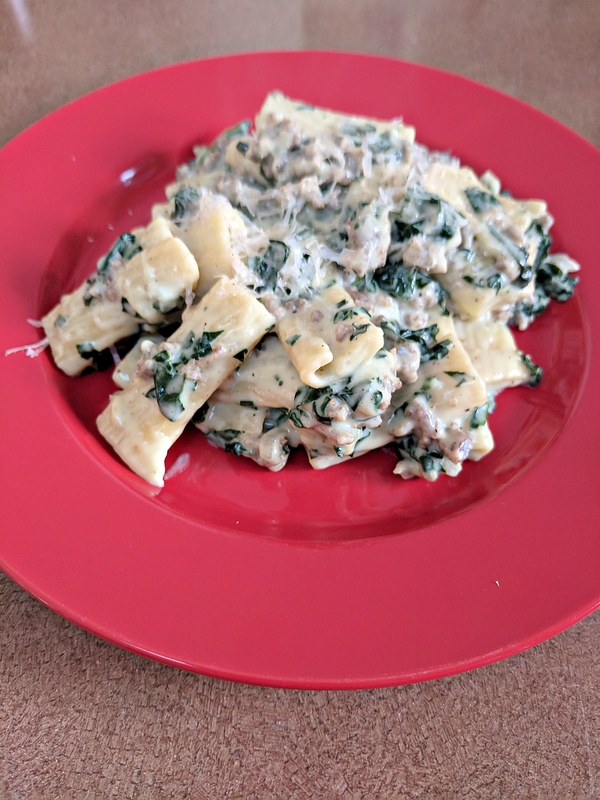 The kale stood up to the cream sauce and sausage without getting lost. Also it scored big points for being a one dish meal. Well, I guess technically it was a two pot because I had to cook the pasta separately, but you know what I mean. This is definitely going into the Family Favorites rotation. Even my grandson loved it and that’s a hard thing to do sometimes. He made a ton of noise about not wanting to eat it, but once he tried the first bite he was shoveling it in. Score a win for grandma! I hope you all enjoy this as much as our family did. Bring a large pot of salted water to a boil. Add the pasta and cook as the label directs. Reserve 1/2 to 1 cup cooking water, then drain the pasta. Meanwhile, heat the olive oil in a large Dutch oven or wide skillet over medium high heat. Add the sausage and cook until browned, about 5 minutes. Transfer to a plate using a slotted spoon; set aside. Wipe the Dutch oven clean; add the butter and melt over medium heat. Add the garlic and cook, stirring, until slightly softened, 1 to 2 minutes. Add the kale and cook, stirring occasionally, until wilted, 3 to 4 minutes. Sprinkle in the flour and cook, stirring, until combined, 1 to 2 minutes. Add the milk to the kale mixture and bring to a boil; cook 1 minute. Add the nutmeg and salt and pepper to taste to the cream sauce. Stir in the sausage, parmesan, and lemon zest. Reduce the heat to medium low and simmer, stirring occasionally, until slightly thickened, about 6 minutes. Add the pasta to the pot and toss, adding enough of the reserved pasta water to loosen.